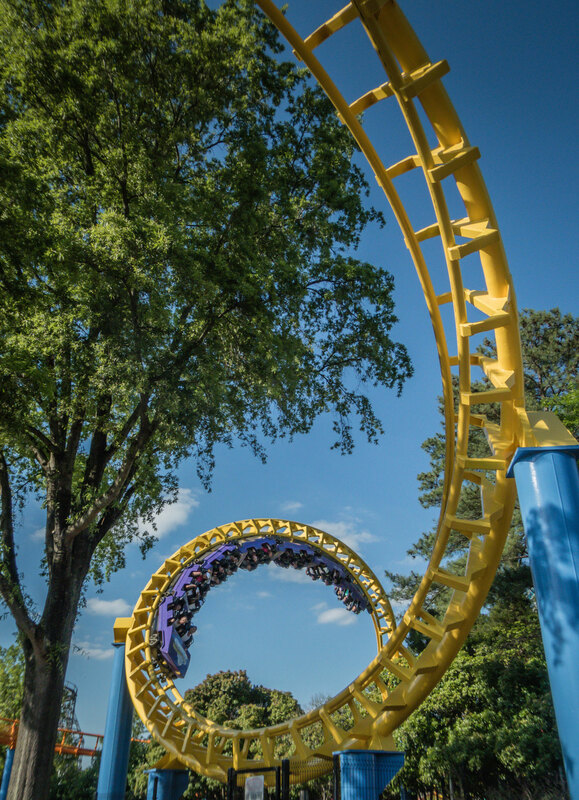 Loch Ness Monster at Busch Gardens Williamsburg in Virginia, USA. 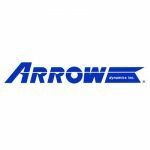 Arrow Dynamics was founded in 1946 in California, USA, by Edgar Morgan, Karl Bacon, and Walter Schulze as a machine manufacturer. It wasn’t until a certain Mr. Disney started looking into rides for his park in the 1960’s that gave Arrow a foot in the roller coaster industry door. 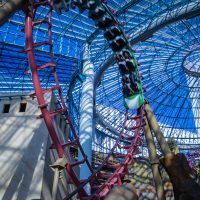 Coaster enthusiasts have a lot to thank Arrow for. 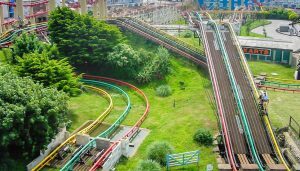 Arrow was the first company to use tubular steel tracks for their coasters, as well pioneering the modern looping coasters we see today. 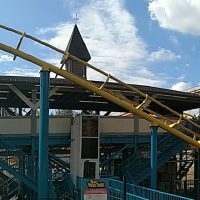 This was done in large part to legendary designer Ron Toomer, who was hired by Arrow in 1965 and was responsible for most of Arrow’s record breaking coasters. 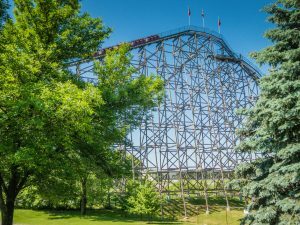 The world’s first hyper coaster (a full-circuit steel coaster over 200ft) was built by Arrow in 1989 – Magnum XL 200 at Cedar Point. Arrow ended up building four hyper coasters in total. 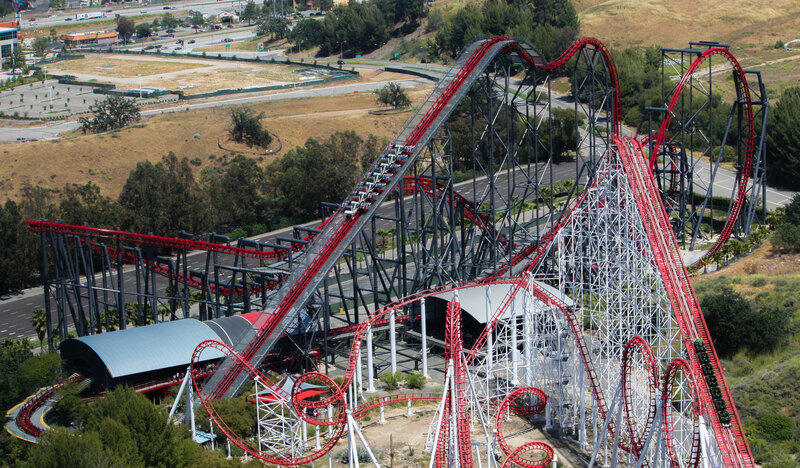 In addition to hyper coasters, Arrow Dynamics were the first to produce many other roller coaster types, including the revolutionary 4D coaster X at Six Flags Magic Mountain. 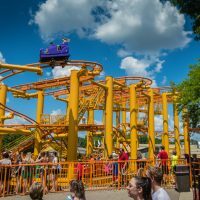 The Mad Mouse at Valleyfair! Matterhorn Bobsleds at Disneyland in California, USA. 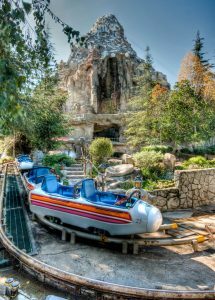 Arrow Dynamics’ first coaster – Matterhorn Bobsleds – was built in 1959 at Disneyland in Anaheim, California. 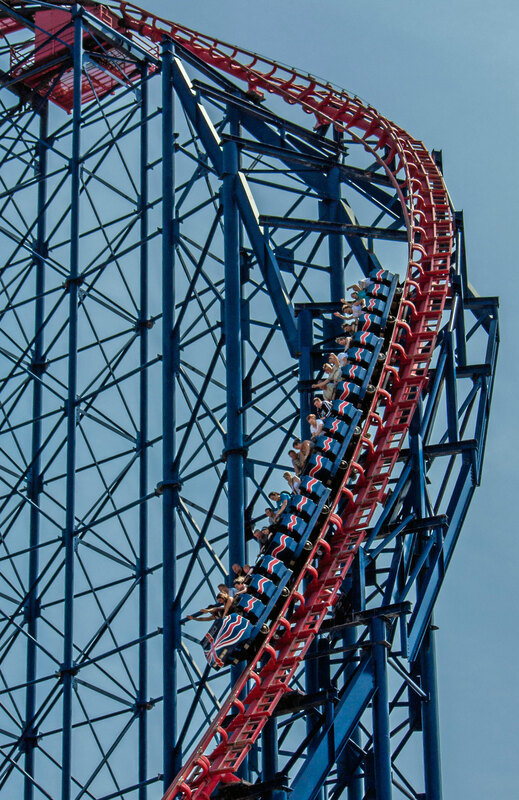 It was the first modern tubular steel tracked roller coaster in the world and is comprised of two intertwining coasters that run through a man-made mountain. 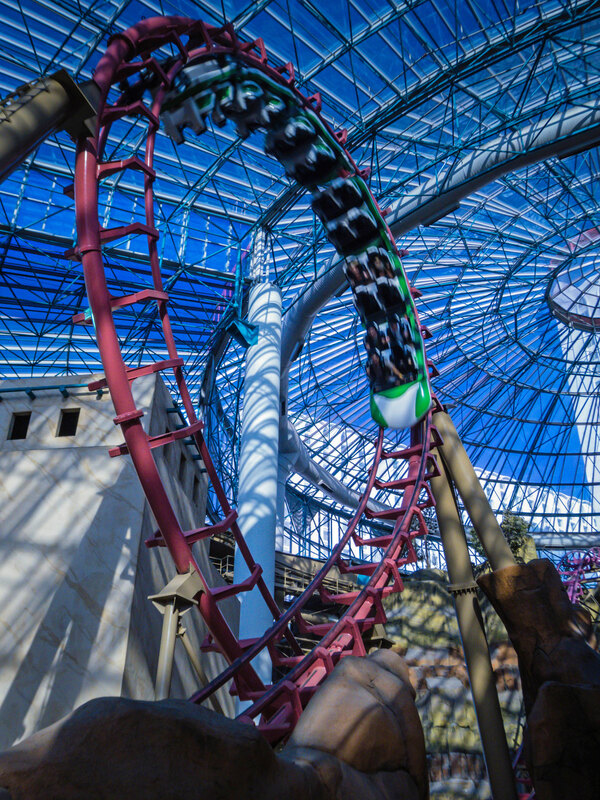 Three major refurbishments were made to the coaster over the years – in 1978, 2012 and 2015. The first added more themeing, including the Abominable Snowman which roars at riders twice, as well as new trains; the second was for outside repairs to the mountain and newer trains with different restraints; while the third included an updated animatronic of the Abominable Snowman and a projected image of the Abominable Snowman at the top of the lift hill as part of Disneyland’s 60th Anniversary Diamond Celebration. 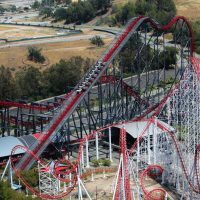 Arrow designed and built the first 4D roller coaster, X at Six Flags Magic Mountain (or X2 as it’s now called), and when it opened in 2002 it was also the first coaster to use winged seats. Fourth Dimension Coasters utilize four running rails instead of two. Two are the usual rails that the coaster’s train wheels run on and the side pair of rails (or “seat control” rails), which are located to the outside of and under the main running rails, are attached to seats and allow the seats to rotate 360° as the train travels along the track so passengers could be riding head first at one point and then on their back the next. 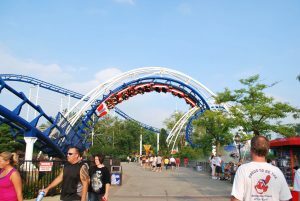 Corkscrew at Cedar Point in Ohio, USA. 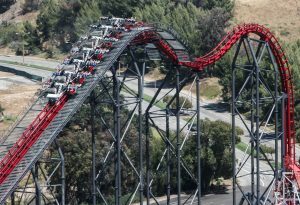 Corkscrew at Knott’s Berry Farm in California, USA (now at Silverwood in Idaho) was the first Arrow Corkscrew Coaster and the first modern inverting coaster when it opened in 1975. 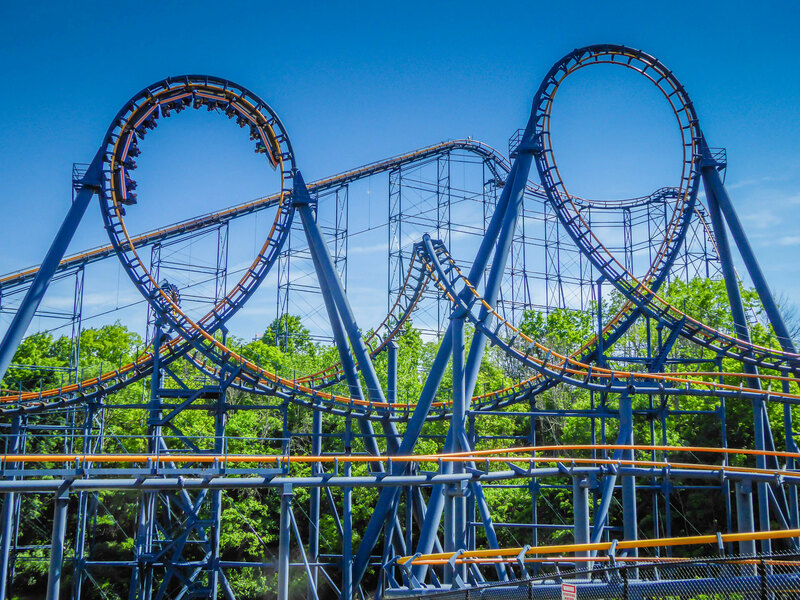 Of the 14 corkscrew coasters originally built by Arrow between 1975-1982, ten are still in operation (seven of which have been relocated). 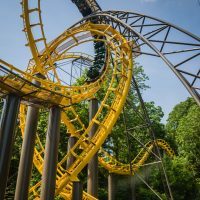 Arrow’s Corkscrew Coasters proved to be so popular that Vekoma came up with a similar design and started manufacturing their own corkscrew coasters in 1979. Vortex at Kings Island in Ohio, USA. 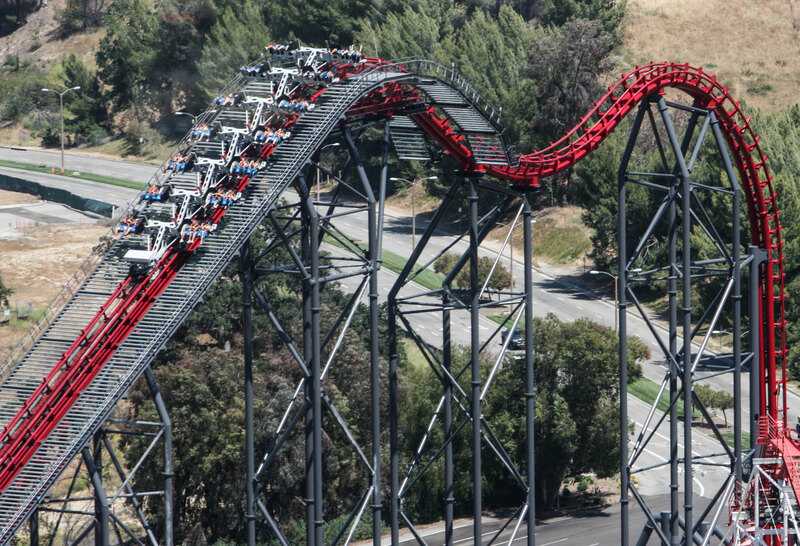 Arrow’s first Custom Looping Coasters were the Demon coasters at California’s Great America and Six Flags Great America in Illinois, USA, which opened in 1976 and featured multiple inversions by combining vertical loops with corkscrew elements. 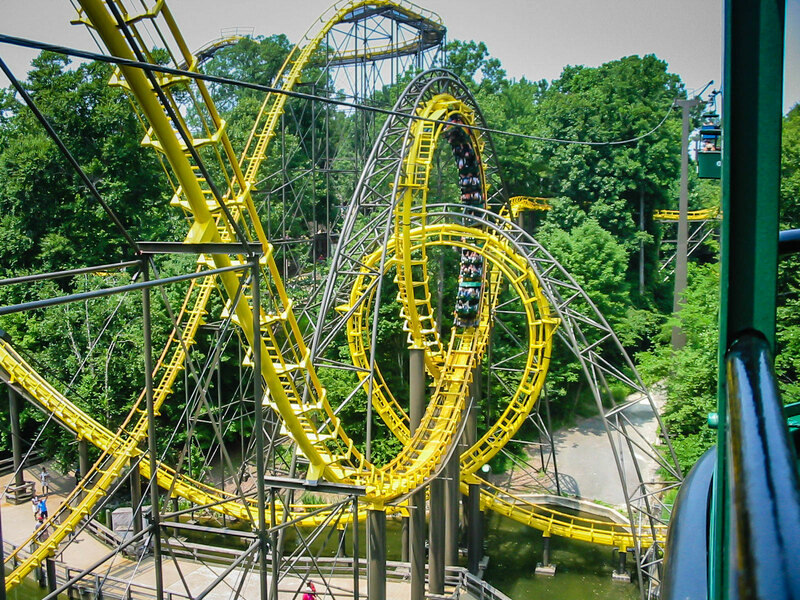 Arrow custom loopers went on to break many inversion records including the world’s first coaster with consecutive vertical loops, Double Loop at Geauga Lake, the first coaster with interlocking loops, Loch Ness Monster at Busch Gardens Williamsburg, and the first coasters with 4, 5, 6 and 7 inversions. 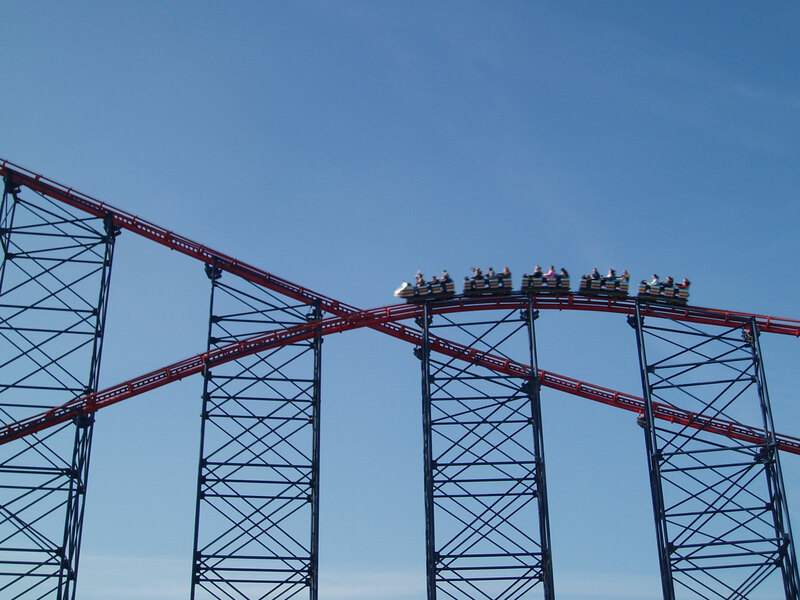 The Big One at Pleasure Beach, Blackpool in the UK. 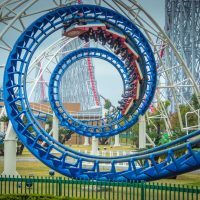 Arrow built the first Hyper Coaster, a full-circuit steel coaster over 200feet (61m) in 1989 – Magnum XL 200 at Cedar Point. 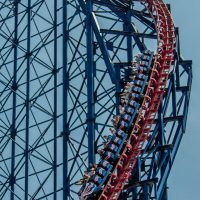 Standing 205 feet (62.5m) tall with a top speed of 72 mph (116 km/h) it was the tallest and fastest coaster in the world when it opened. 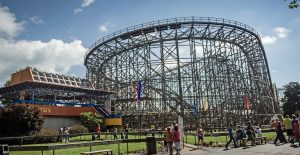 Arrow broke those records in 1994 with two other hyper coasters. 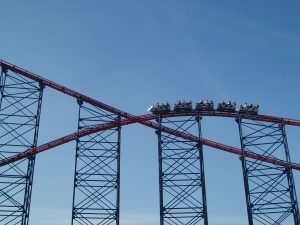 The Big One at Pleasure Beach Blackpool was the world’s tallest at 213 feet and remains the tallest in the UK to this day, while Desperado in Nevada was 8 mph (13km/h) faster, with a 225 foot (68.5m) drop – the biggest of any coaster at the time. Revolution at Pleasure Beach, Blackpool in the UK. 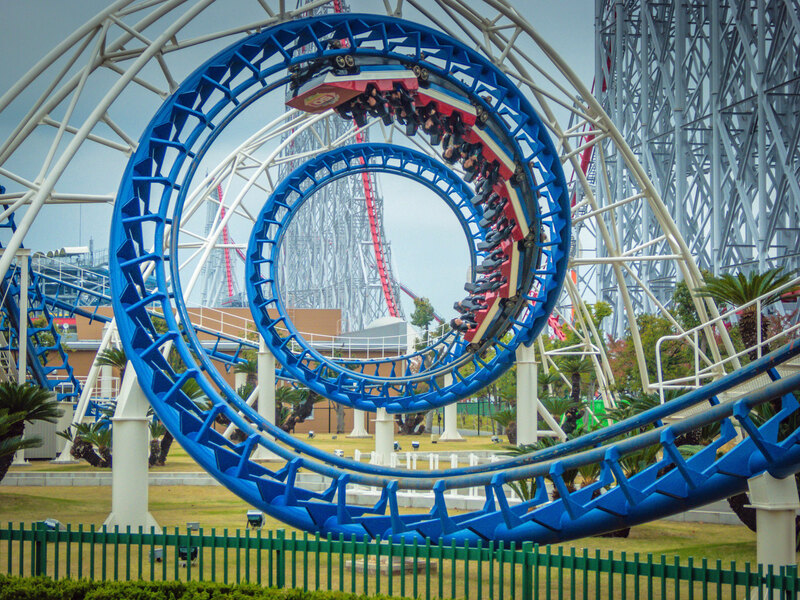 An Arrow Launched Looper is a shuttle coaster consisting of two elevated platforms separated by a single loop. 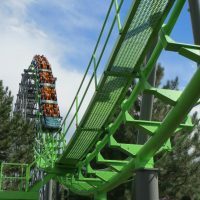 The train is launched from the loading platform, drops down a hill through the loop and then climbs the following hill to the opposite platform before repeating the route backwards. 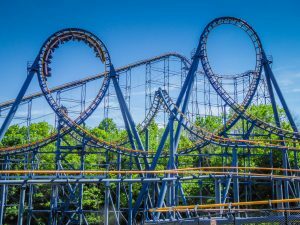 Lightnin’ Loops at Six Flags Great Adventure (1978-1992) combined two launched loop coasters with interlocking loops, one of which is now Diamond Back at Frontier City in Oklahoma. 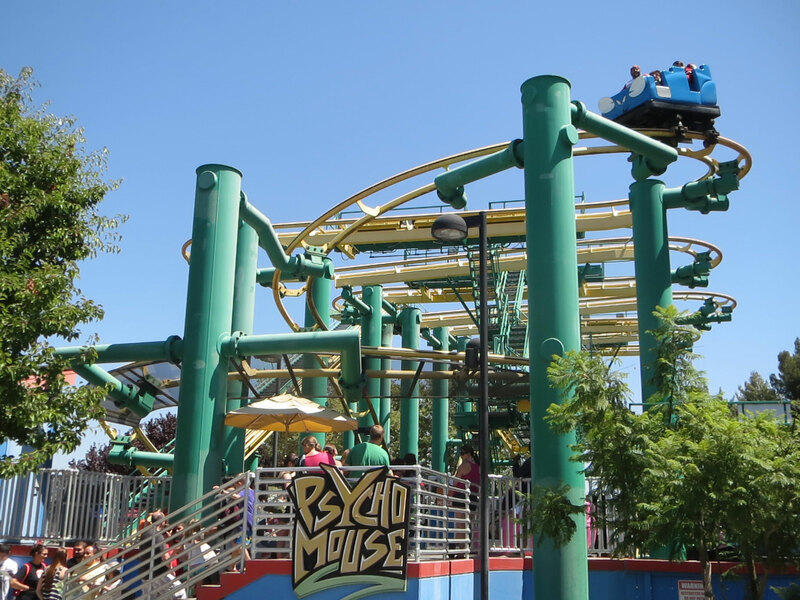 Psycho Mouse at California’s Great America in California, USA. 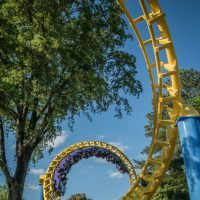 Arrow’s Wild Mouse Coasters have a large flat section of upper track consisting of sharp turns with high lateral forces and lower sections of track with a few drops and/or bunny hops. 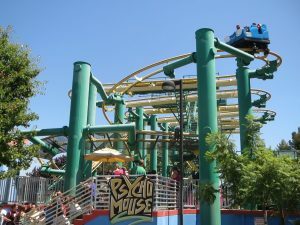 Their first wild mouse coaster was Mad Mouse at the Myrtle Beach Pavilion in South Carolina, USA, which opened in 1998. 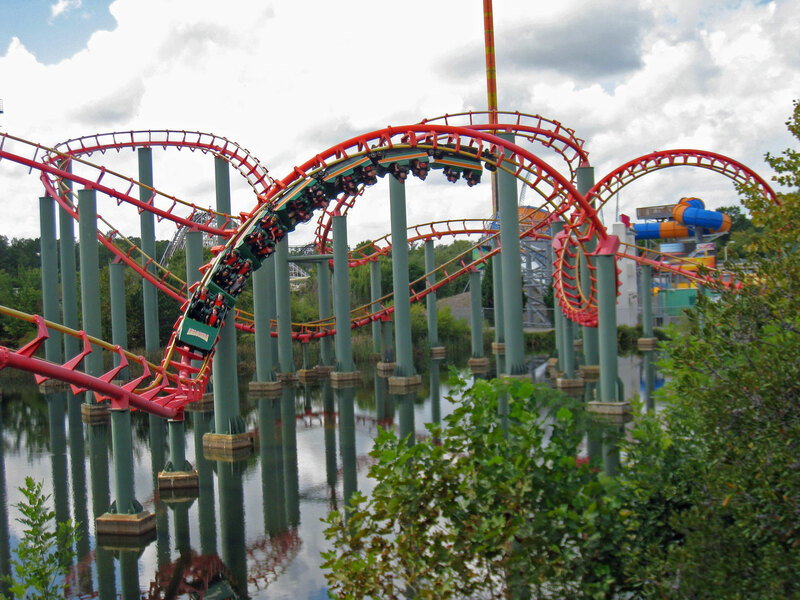 Arrow built three more wild mouse coasters over the next three years before the company went out of business. 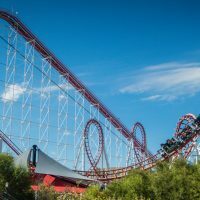 Arrow built the first Mine Train at Six Flags Over Texas in 1966, which has all the trademarks of today’s mine train coasters – mine cart styled trains, multiple lift hills, several banked turns or helixes and level straightaway sections, but few large drops. 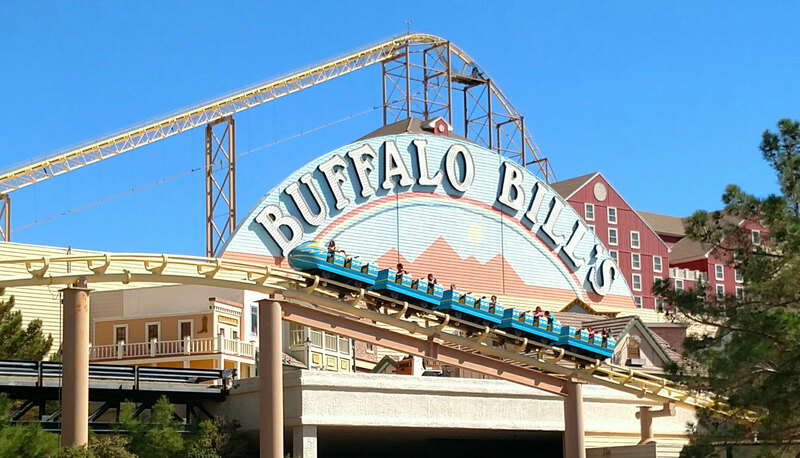 It was the first production coaster to use tubular steel rails and advanced roller coaster technology into a new era. 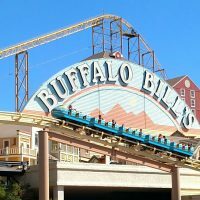 The company went on to build dozens more over the following decade as Mine Trains became a staple in parks across the USA. 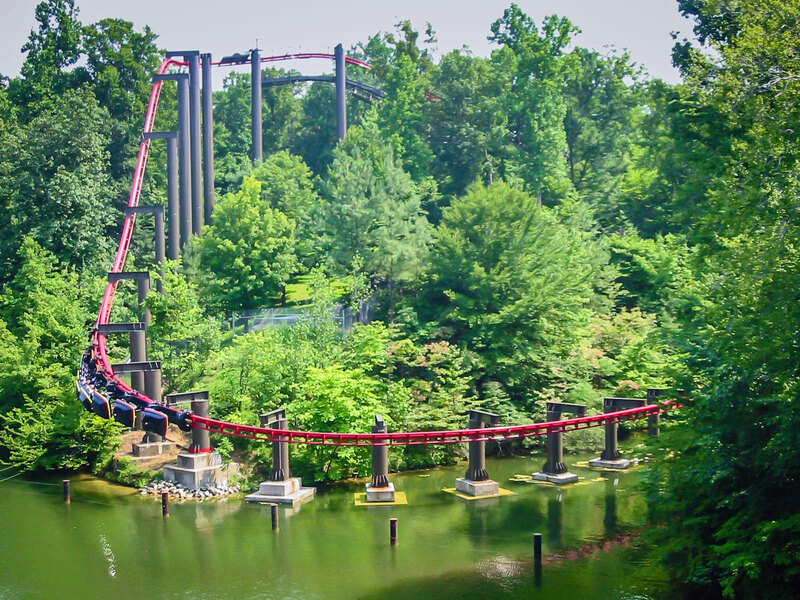 Big Bad Wolf at Busch Gardens Williamsburg in Virginia, USA. 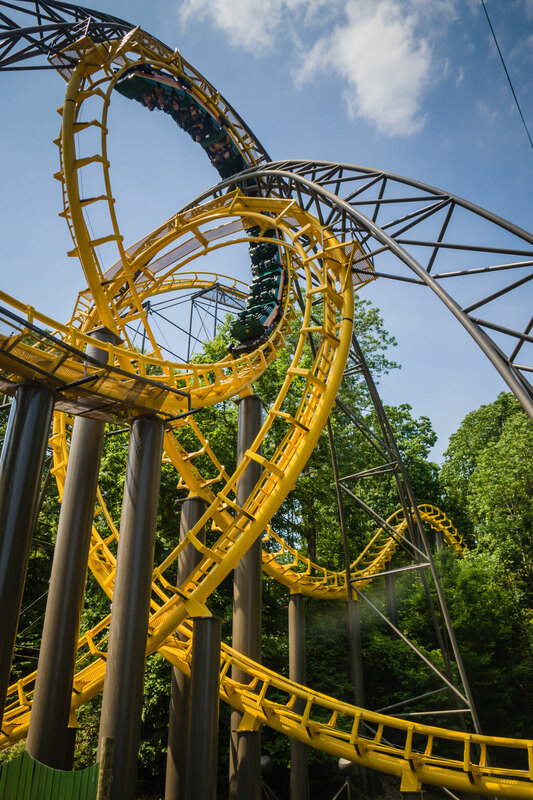 Arrow built the first modern Suspended Coaster in 1981 – The Bat at Kings Island in Ohio, which swung freely from a track above. 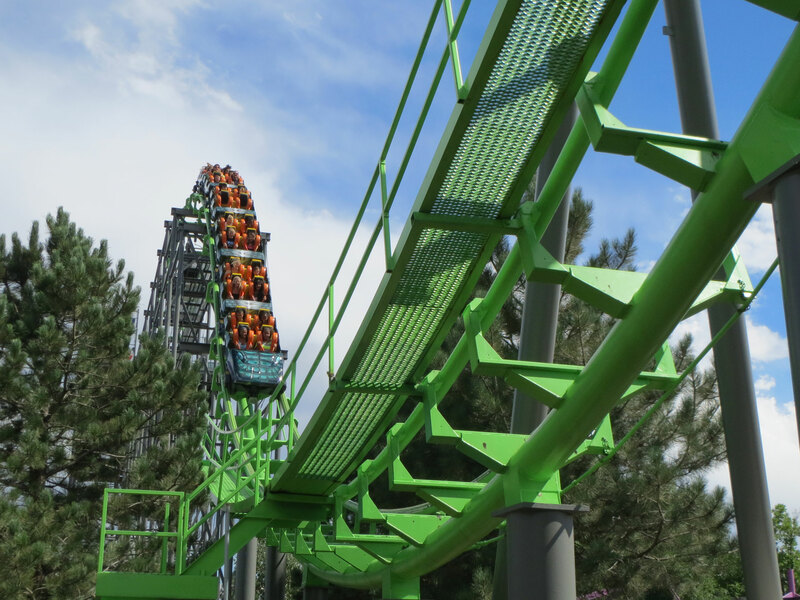 However the coaster was plagued with problems like extreme stress on the support swings and wheel assemblies. 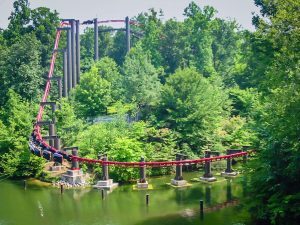 The Bat closed in 1983, but Arrow redesigned future models and produced a dozen more starting in 1984 with Big Bad Wolf at Busch Gardens Williamsburg in Virginia, USA. 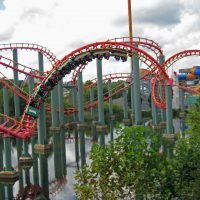 In spite of the improvements, the coasters still required a lot of maintenance and when Arrow went out of business spare parts became hard to come by. This led to the closure of many of their suspended coasters, with only a few still operating. Gemini at Cedar Point in Ohio, USA. In addition to Matterhorn Bobsleds, Arrow built a few other unique coasters. 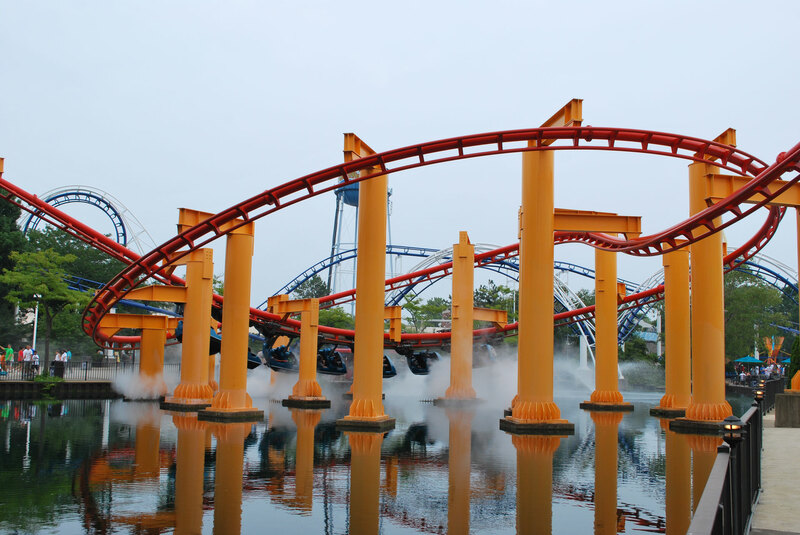 Other than the Disney classic, the most well known is Gemini at Cedar Point in Ohio, USA. The steel hybrid dueling coaster opened in 1978 as the tallest, fastest and steepest roller coaster in the world and remains a park guest favorite. 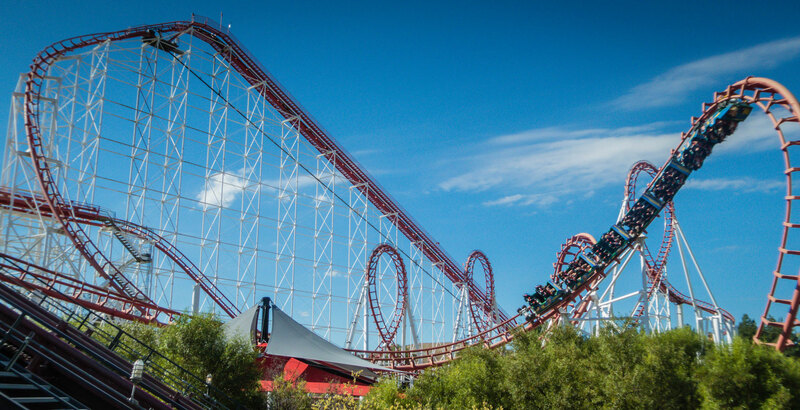 One of the most unique coaster designs Arrow created was the “monorail” concept Cycle Chase at Knott’s Berry Farm in California, USA. This motorcycle themed coaster had trains that consisted of three motorcycles that could seat up to two riders that raced around the track. 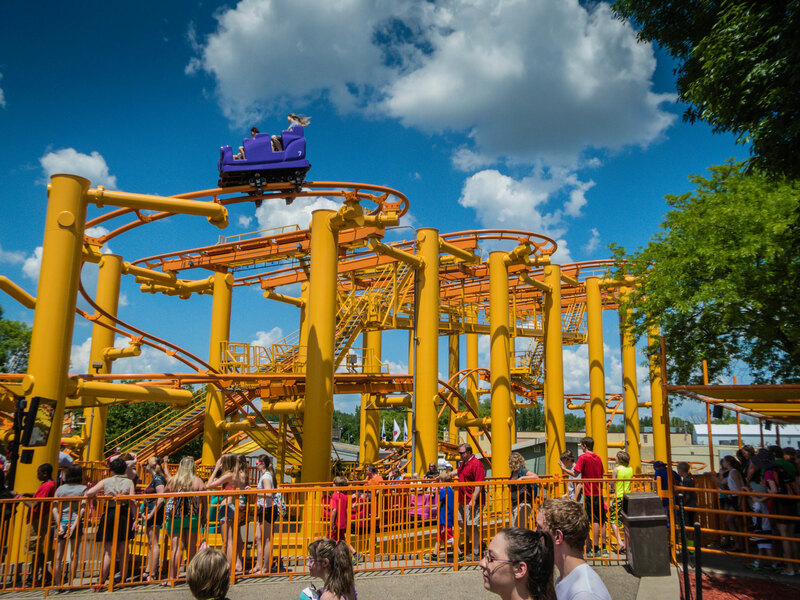 Five years after opening in 1976, the design and name was changed to Wacky Soap Box Racers where the motorcycle trains were switched to single cars that could hold up to five riders. Steeplechase Pleasure Beach, Blackpool in the UK. 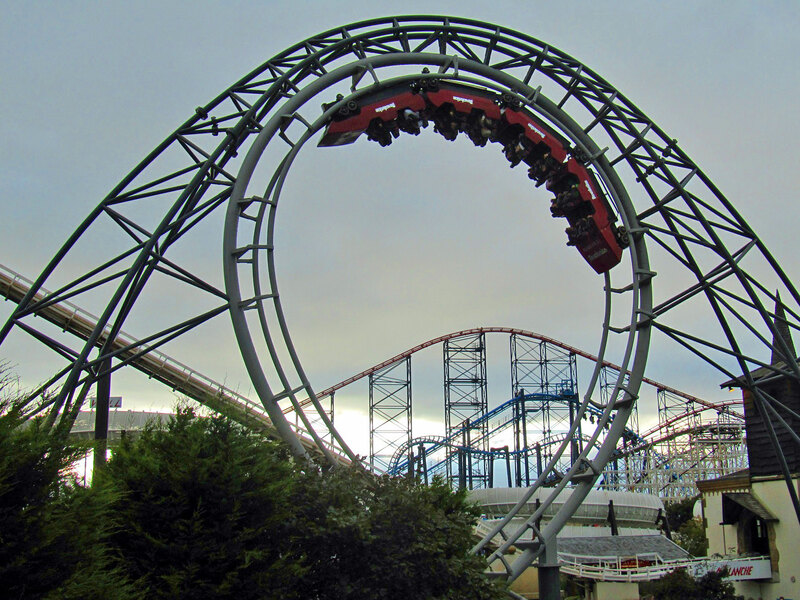 A year after Cycle Chased opened, Pleasure Beach Blackpool brought the same model to the UK called Steeplechase, where up to two riders mount horses to race around the track. Unlike the counterpart in the USA, which closed in 1996, Steeplechase still operates to this day. Excalibur at Valleyfair! in Minnesota, USA. 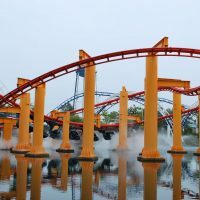 The final one-off coaster Arrow manufactured was Excalibur at Valleyfair! in Minnesota, USA. 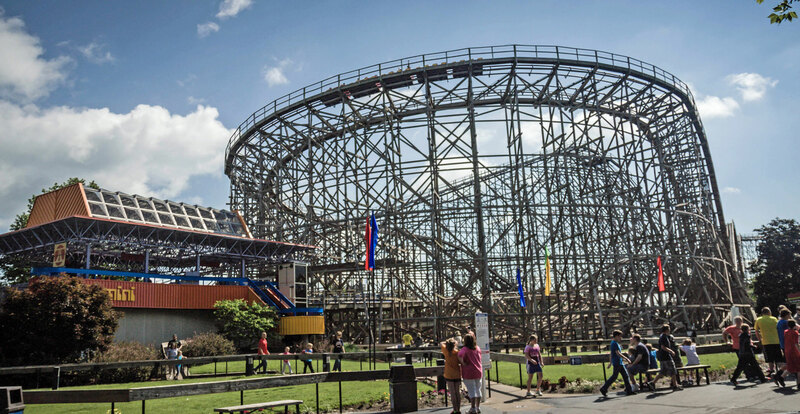 This is another steel hybrid coaster similar to Gemini, but is a single model rather than the dueling one built in Ohio 11 years earlier. Unfortunately, Arrow Dynamics went bust in 2001 leaving behind a legacy of 101 roller coasters. All of its assets were brought by S&S Worldwide in 2002, who preserved most of the company under the name “S&S Arrow”. While not quite the same, it is comforting to know that Arrow will still influence future attractions.